Beauty Professor: Weekend Sales, Coastal Road Trip Mini Recap + Summer Foundation Rundown on the Neiman Marcus Blog! Weekend Sales, Coastal Road Trip Mini Recap + Summer Foundation Rundown on the Neiman Marcus Blog! Happy cusp of the weekend to you! What are your plans? After an intense month of traveling, I am so excited to settle in for the month of July. In honor of the holiday, this post is dedicated to the abundance of weekend sales (with my suggestions! ), a quick recap of my latest roadtrip and an overview of my latest story--all about summertime foundations--for the Neiman Marcus Blog. Running with Jasper and Jethro (metaphorically, that is) to the sales that abound online this weekend. Shopbop (up to 70% off): I am loving this Willow Maxi Dress (in an array of colors), these Rag & Bone Harrow Booties (modern classics in a great warm weather shade) and these J Brand Cutoffs (not too long, not too short). Equipment France (30-40% off): I have my eye on the Slim Signature Silk Shirt in Rose (this muted blush tone is stunning), the Mina Silk Dress (in a snake print that, as far as I am concerned, is a new neutral) and the Elcie Cotton Blouse (which I will wear with jeans and also with a bikini). Nordstrom: I'm getting super excited for the upcoming Anniversary Sale, which begins with Early Access for cardholders on 7/14/16. I will for sure be picking up the FRAME Jeans (on page 4 of the digital catalog) and the Stewart Weitzman booties (on page 86). For sales exisiting immediately, I recommend this Rails blouse, Equipment dress, Frame Le Classic Silk Shirt, Levi's 501 cutoffs and Topshop sweatshirt (shown below...I wear both the shorts and a similar sweatshirt constantly as of late). Neiman Marcus (up to 55% off already reduced merchandise): Some steals include these Gucci sunglasses, FRAME Tee and Helmut Lang sweatpants that collectively create a relaxed yet chic summertime outfit. Free People (30-50% off): This embroidered mini dress, tetons cutoffs (for a fresh, longer silhouette), ribbed top and Berlin heels are perfect summer staples. Beauty Bits: I'll also be picking up a couple of new Marc Jacobs Beauty Air Blushes and the Tom Ford Orchid Soleil...also, if you haven't yet taken a peek, I implore you to consider procuring the recently-released Wayne Goss Air-Brush (reviewed HERE). At $35, it is luxuriously affordable and its buffing capabilities are insane...I am truly enjoying how well this seamlessly blends bronzer and highlighter. It's simply exquisite. Leaving our hotel in San Simeon to meet the guys at their campsite. **Makeup details below. **Makeup details in the above image as follows: *Surratt Beauty Surreal Skin Foundation #9 (reviewed HERE), By Terry Sun Designer Palette in #02 (reviewed HERE), *Becca Shimmering Skin Perfector in Champagne Pop (reviewed HERE) applied with the *Wayne Goss Air-Brush (reviewed HERE), Gucci Magnetic eye Duo in Primrose (reviewed HERE) and *Sisley Phyto Lip Twist in #10 Sugar (a perfectly opaque, shiny cool baby pink that is always in my purse). This combination lasted for 10+ hours and effortlessly took me (and my mom!) through the trip. This past week, my mom and I took the pups up the coast of CA to meet my husband, dad and brother at their campsite near Big Sur where they had been kayak fishing for a few days prior. At Limekiln beach...unspoiled nature at its best. Our tent...that's my new golden sleeping bag on the right...super warm yet light. On a rock with Jethro as the tide began to rise...my brother captured this moment! (1) Which weekend sales are catching your eye? (2) What trips have you or will you be taking this summer? (3) Are you wearing foundation this summer? If so, which formula are you currently loving? Good things ahead, including a preview of the coveted Charlotte Tilbury Hot Lips, the Marc Jacobs Airblush and a host of new product procurements...cannot wait to share. what lipstick do you have on in the photo with your mom (who is beautiful!!)? Thanks for asking and also for your kind words about my mom...I agree! I just updated the makeup details for that image...I have the Sisley Phyto Lip Twist in Sugar on the lips; it's a favorite! Also please let us know the specific foundation you're wearing! Gorgeous! It's the Surratt Surreal Skin Foundation Wand in #9...a great match for my light olive skin and the formula wears flawlessly for hours on end. Updated links to both my review and the product itself right below the image now! 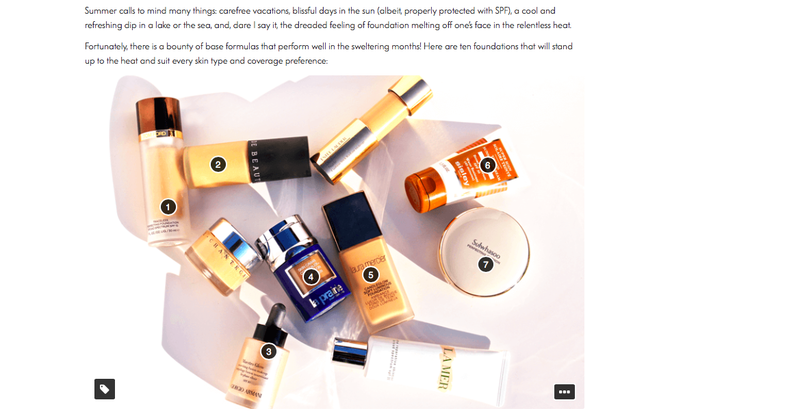 I am also loving the Trish McEvoy Beauty Balm this summer! I am an opera singer performing at an outdoor festival in the HEAT and it stays all day through my sweat and makes my skin feel nourished and wonderful!! Dying to try the Tom Ford one though...maybe this winter! Also, thanks for turning me on to Surratt beauty! Obsessed!!! Happy 4th of July weekend to you and your family! I hope that you have some nice festivities planned. You've posted some lovely photos of your trip away to CA with lots of glorious sun shining! It is winter here in Australia so I'm wearing lots of moisturizing products to assist with maintaining a little glow and for much needed hydration. 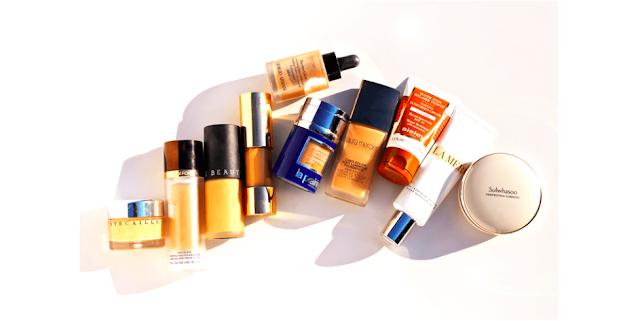 I am loving the Josie Maran Vibrancy Fluid Foundation with argan oil, as it offers a real skin finish, good lasting power and wears beautifully on the skin. It's become a real favorite! Hi BP Great looking girls you and your mom! Sales I am shopping this weekend include a surprise flash sale at Boxy Girl, I bought the Lucite make up organizer (without lid) that I have had my eye on for a while. Regular $199 on sale for $69! It is a beautiful! That is fantastic news...so glad you got a wonderful deal on Boxy Girl...their boxes are marvelous! Hi BP - Each of the images in this post is more beautiful than the last! Looks like you had a wonderful time with your lovely family. I wanted to thank you for the summertime foundation update. I've just ordered Future Skin on the strength of your recommendation. Wow...thank you so much! What an amazing compliment. I am so glad you picked up Future Skin and hope you're loving it! Hope your summer has been incredible...much love to you! I love your posts! What are the black sneakers that you are wearing in the pic with the dogs? Thanks, Jennifer...they are by a brand called Supra!